RSMSSB Women Supervisors Exam 2018. RSMSSB Supervisors Answer Key 2018-19. RSMSSB Mahila Supervisors Question Paper with Answer Key. RSMSSB Mahila Supervisors Answer Key PDF. RSMSSB Women Supervisors Answer Key and Question Paper. As we all know that Rajasthan Subordinate and Ministerial Service Selection Board (RSMSSB) has invited online applications from eligible candidates for 180 posts of Supervisors (Women Empowerment) in Women Empowerment Department, Government of Rajasthan. Today RSMSSB conducted RSMSSB Women Supervisors Exam 2018 and the exam timing is 11.00 Am to 2.00 PM. Those candidates who are preparing for RSMSSB Women Supervisors Exam now waiting for this RSMSSB Women Supervisors Answer Key and it would be very helpful for them. RSMSSB Mahila Supervisors Answer Key 2018 has been provided by LST users in pdf format. The RSMSSB Supervisors unofficial answer key is released an hour or two later the exam is over. The RSMSSB will release the Official answer key for RSMSSB Mahila Supervisors Exam 2018 Answer Key at its official website soon(http://www.rsmssb.rajasthan.gov.in). RSMSSB Women Supervisors Written Exam will be multiple choice/objective type. The time duration of test will be 03:00 hours. The candidates who fail to obtain a minimum of 40% marks shall not be eligible for appointment. Minimum Passing marks are 80. How to Download RSMSSB Women Supervisors Answer Key 2018-19? You can download the RSMSSB Women Supervisors Question Paper PDF and their solutions from the given below link. 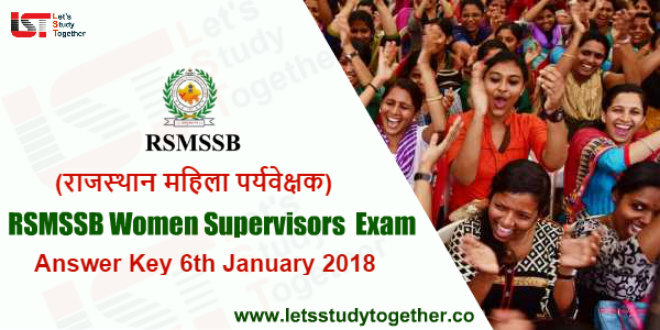 Solving RSMSSB Women Supervisors 2018 Paper PDF will give you confidence and enhance your exam preparations.